Heather Dahmer’s husband Jim was exposed to asbestos throughout his career: as a plumber, steamfitter and maintenance supervisor. He was diagnosed with mesothelioma, an incurable cancer, and died in 2011. After her years as Jim’s partner and caregiver, Heather was left alone and grieving. She now shares his story to try to prevent other workplace tragedies, and volunteers to help other families cope with illness, injury and loss. Heather and her husband Jim came to Threads of Life in 2007, when they were three years into Jim’s mesothelioma diagnosis. He had been given six months to live, but as Heather wrote in 2007, “our pity parties have become gratitude parties – Happy Hour included!” Jim lived for seven years following his diagnosis – years of tests, treatments, radiation, medications; but also parties, golf, laughter and family time. They appreciated the acceptance and support they found through Threads of Life, and together joined the speakers bureau so they could share their story and advocate for healthier workplaces. After Jim’s death, Heather found herself in a black hole of sadness and loss. But gradually the light snuck back in. 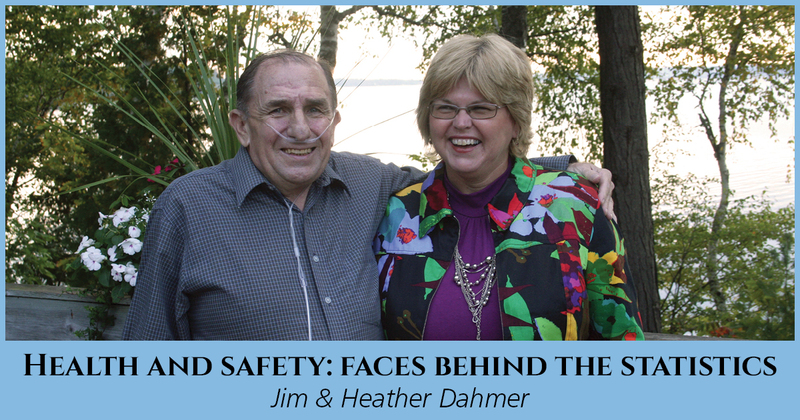 When the time was right, Heather trained as a Volunteer Family Guide, so she could help to provide the comfort and understanding that had helped both her and Jim along the way. Jim and Heather’s story “Living with Dying” also appeared in Forget Me Not, a Threads of Life book of family stories available at www.threadsoflife.ca/forget-me-not. If you or a loved one have experienced an occupational disease or other workplace tragedy, read about how Threads of Life can help you.